Whenever I see a buttermilk sky I am drawn to watching its curdled passage across the heavens. It’s a harbinger of weather systems on the move I’m sure, but of exactly what kind I am not. Still, they make for great skyscapes and play well with almost anything they relate to, like these trees with their frail, wintery branches whose color, somewhere between gold and green, vibrates against the blue. 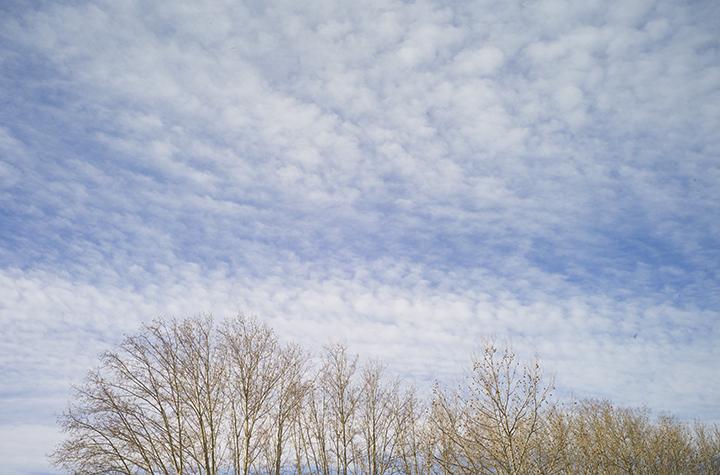 This entry was posted in Buttermilk sky, Provence and tagged France, Landscape, Provence, sky, Trees on February 8, 2015 by joelmeyerowitz2014.